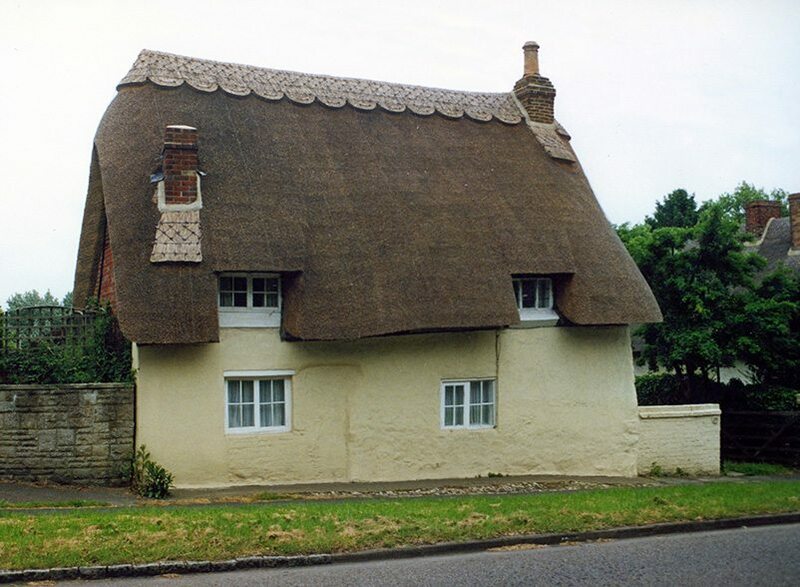 British thatchers seem to follow five basic thatching styles. These various styles appear on work designed to provide the most long lasting protection, that local conditions permit. Work of a more temporary nature, such as rick or stack thatching and repair work, tends to be the same throughout Britain. 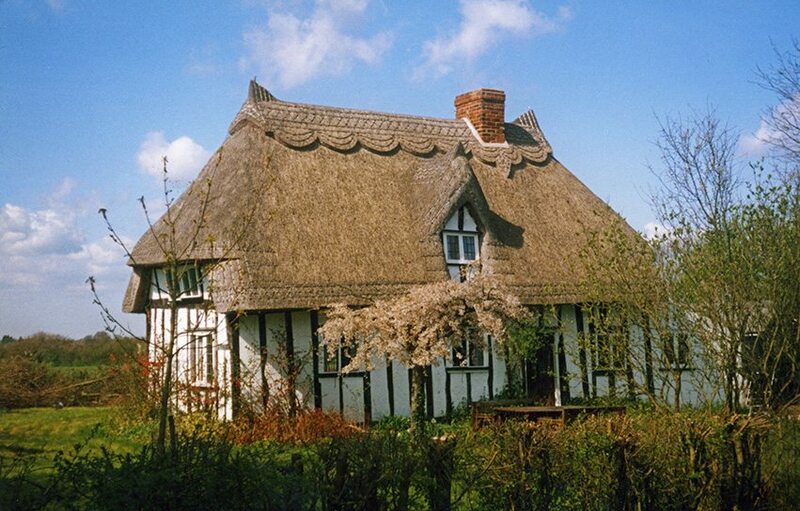 As are the basics of standard thatching; the various styles being reflected in the local treatment of the thatch details; such as gable ends, roof shape and ridge. At first sight, there seems to be little difference in these various styles; each one appearing to join seamlessly into it’s neighbour. But once the differences are noted, it is amazing how consistent each style is within it’s area. To complicate matters, over time, parts of Britain have been influenced by more than one style, or Tradition; as I have termed these various working methods. Of course it’s the thatcher who creates the style; usually by following working methods passed down to them. Even today most train and thatch locally; so the various styles of work, have, in the main, not strayed far. However, as long straw thatching has declined and water reed thatching has spread; in recent decades, some dilution of style has taken place. 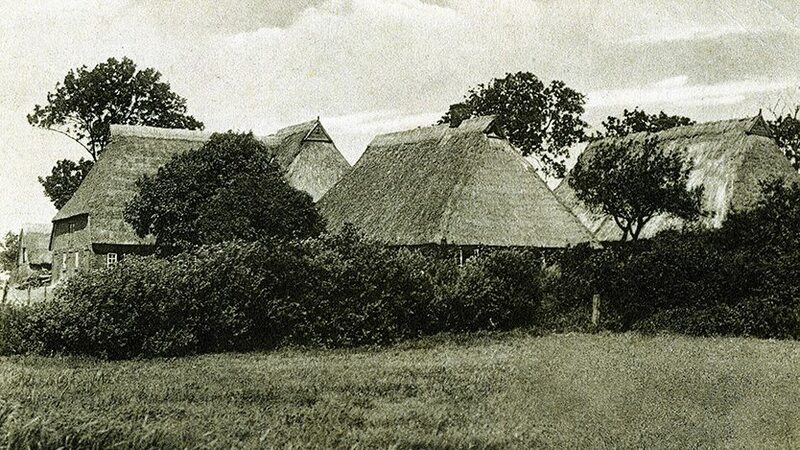 But by examining old images it has been relatively easy, to establish the number and the historical spread, of the various thatching traditions found in Britain. Firstly there is a difference; between the areas where standard thatching is normal and where it is not. This sets what I have termed the non standard Highland Traditions, apart from all the others. Secondly, the standard thatching areas then break down into two regions. One having an angular shape to any thatch; the other employing a more rounded effect. These two main regions themselves, also divide into two. The Northern and Eastern traditions follow an angular shape; the Southern and South Western areas have a more curved effect. Mapped out… The five thatching traditions. The exact boundaries of which, should not be taken too literally… As any border areas are quite wide and contain working methods from adjoining traditions. The type of work our near neighbours employ is also illustrated; showing how much our thatching shares with them. The scene is dominated by the large Northern tradition, which today has relatively few thatched roofs; most being found in the three more southerly areas. But even here the Eastern and South Western working methods have made deep inroads into the Southern traditional area. Mainly through the use of water and combed wheat reed. The areas shown reflect the situation a few decades ago, before these changes took place. I have broken the five thatching traditions up into areas; these being based mainly on what are often called today, the ceremonial counties of Britain. If more than one county is included, they will in the main have much in common. As will become apparent, the various thatching traditions recognise no modern political borders; and few physical ones. Thus the various styles, do not sit exactly on the old county boundaries but these historical areas are perhaps something we can more easily relate to. Some of these areas share two thatching traditions, the technicalities of this site means I have to put them in one section or another, so please bear this in mind…. In the South Western Tradition. 42. 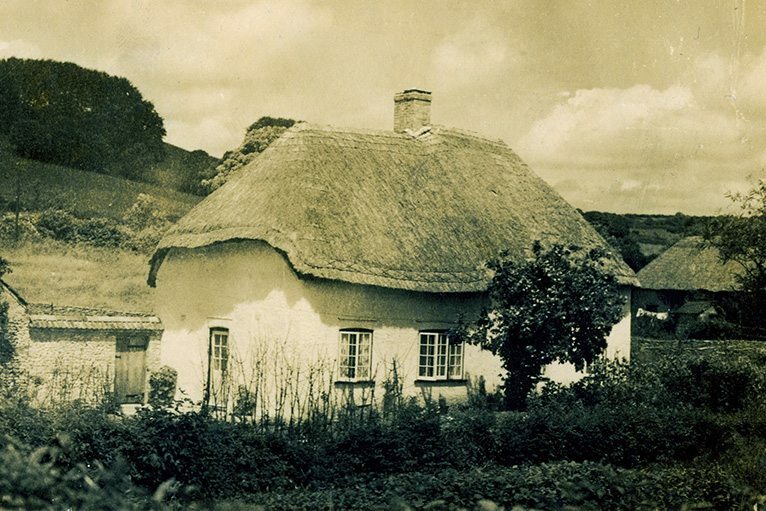 Thomas Hardy & Dorset’s Thatch. 46. 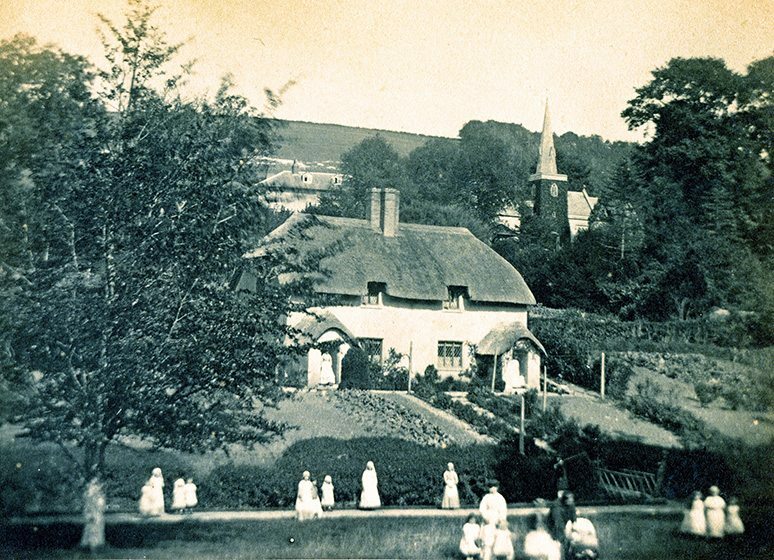 Devonshire Thatching in 1901. 49. The Isles of Scilly. 3. The North West Highlands; Caithness, Sutherland & mainland Ross and Cromarty. 4. The Inner and Outer Hebrides. 5. Inverness-shire and Argyllshire, Bute & The Isle of Arran. 7. From the Moray Firth to the Firth of Tay; Angus, Kincardine, Aberdeen, Banff, Moray and Nairn. 8. Perthshire, Kinross, Clackmannan, Stirling & the Kingdom of Fife. 9. South East Lowlands; Peebles-shire, Selkirk, Roxburgh, Berwick & The Lothians. 10. South West Lowlands; Wigtown-shire, Kirkcudbright, Dumfries, Dunbarton, Lanark, Renfrew & Ayrshire. 11. Robert Burns & Ayrshire’s thatch. 12. Northumberland & County Durham. 13. Cumberland, Westmorland & Furness. 17. Anglesey, Caernarfonshire, Merionethshire and Montgomeryshire. 18. North & East Ridings of Yorkshire. 19. Derbyshire, Nottinghamshire & West Riding of Yorkshire. 25. The Thatched Churches in East Anglia. 29. The City of London. 32. Thatching at Anne Hathaway’s Cottage. 37. Isle of Wight & Hampshire. 39. Pembrokeshire, Cardiganshire and Carmarthenshire. 40. Radnorshire, Brecknockshire & Monmouthshire. In the past others have toured Britain, often examining the local thatching. Some of these were the intrepid Reporters, compiling the View of Agriculture, for their county. Many of their comments are examined in a page in the History section. But more of these have been added to the relevant county pages, as they give a rare glimpse of the craft; from the quarter of a century after 1790. Some counties now have much more thatching than others. Rutland, England’s smallest historical county, has three times the number of thatched roofs, than Yorkshire, the largest. 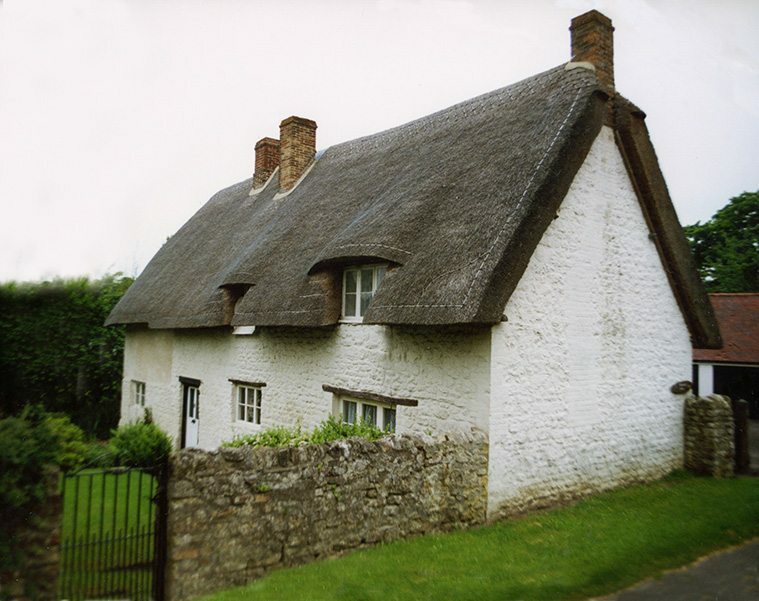 Devon has between a fifth and a quarter of all Britain’s thatch. The modern Highland Region of Scotland has less than in my home village. However, every area gets much the same coverage, each place having a valid story to tell; whether still full of modern thatch or no. The old images which follow, show that the majority of thatching was done simply to keep the weather at bay; a great deal of repairwork being carried out. Long straw, was by far the dominant material. These old images also illustrate the full range of local styles; many having been diluted, in the last few decades. Why five thatching traditions, on what is a relatively small group of islands? Before attempting some answers, an important point must be borne in mind; the main reasons any thatcher follows a particular tradition, are the local climate and supply of materials. For example, Orkney, Shetland and Man all follow the Highland tradition of thatching and share a common Gaelic/ Norse heritage. But similar thatching was once practiced in the far off, culturally separate, Isles of Scilly. The same conditions prevailed; wind, few trees and a scant supply of thatching materials; so similar working methods evolved; that of tightly roped down, thatched roofs. The Isles of Scilly, following a totally different tradition, than that used in the rest of Cornwall. Thus the Highland tradition should be seen, as a tradition of necessity. For, as soon as conditions allow, standard thatching quickly becomes the normal working method; as windy coasts are left behind, or materials become more readily available, due to improved agriculture. An historic lack of some thatching materials is also apparent within the large Northern tradition. It must be remembered, that in the past cereal straw, was much more valuable as animal fodder, than thatch; food being more vital than shelter, in a subsistence economy. So cereal straw was used, only for the coatwork over much of this area. Ridges often being of turf; with this material and anything from branches to gorse, making up the underlayers of the roof. Other thatching materials, such as heather were also widely used when available. 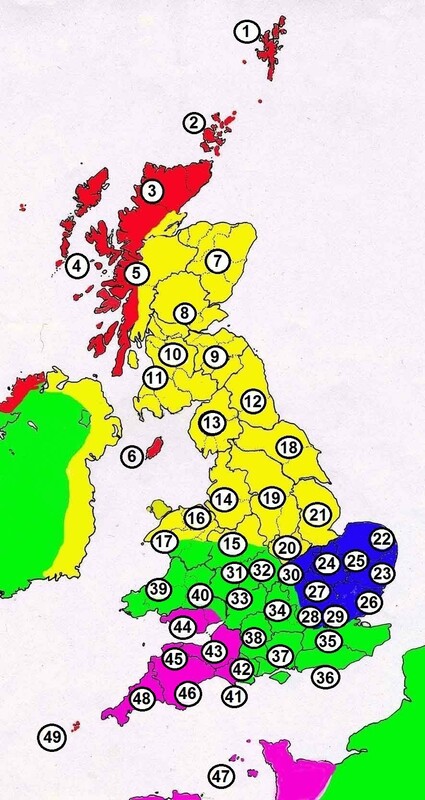 A look at the map will show that the Northern tradition, does indeed cover many of the most challenging areas, for arable farming found in Britain. So climate and material supply are most important. But these factors do not explain all the differences, between the three more southerly thatching traditions. And some found only in the Northern tradition. Now history has to take over, from geography…. When climate and material supply are stripped away, it seems that many of the distinct styles in British thatching appear to date from well over a thousand years ago…. The areas occupied by the various peoples in these islands; during the upheavals of the early middle ages, match many of the boundaries of the thatching traditions; too closely perhaps, to be a coincidence. 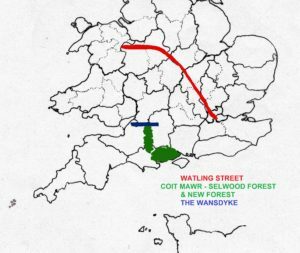 The biggest dividing line of all, that between the angular thatching of the Northern and Eastern traditions and the rounded Southern style, still roughly follows a very ancient line; the northern section of the old Roman road of Watling Street, the modern A5. Seemingly of little significance today; this was once the border between two peoples. Agreed in the peace treaty, between the Saxon King Alfred and Guthrum, the Danish Viking leader; over eleven centuries ago. After making their peace, various Viking armies settled down, to the north and east of the old road; firstly, in what was known as The Danelaw and later in Norse kingdoms, based in York. They quickly formed a class of farmers and peasants. Although the Saxon kings soon regained this area; these people stayed put. 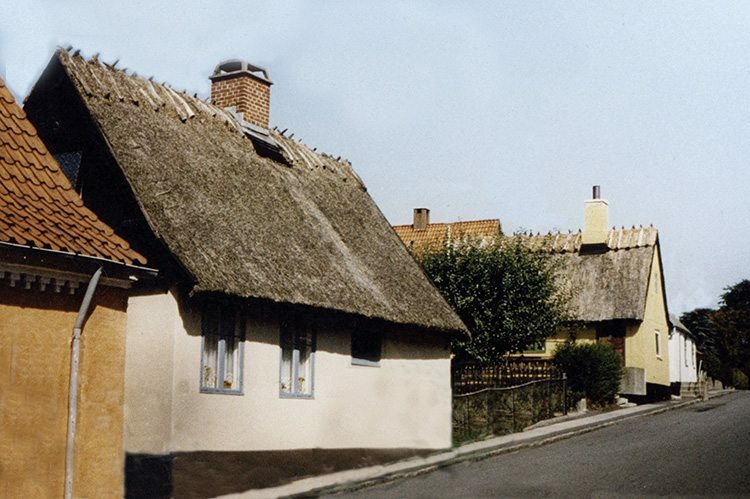 Their influence is still seen, for example, in the widespread use of boarded gable ends, so common in Danish thatching. Over time, the Southern and Northern traditions have slipped across the old road, by a few miles either way. But even today, travelling across the old highway will often bring the differing thatching traditions quickly into view. Across the divide… These two cottages lie next to each other, in Long Crendon in Buckinghamshire; each showing a different style. The left thatch has a Southern Curve, the right a squarer Eastern shape. This mixture is often seen in this county, along with neighbouring Northamptonshire, both forming a sort of buffer zone, between the two traditions. With the A5 curving it’s way across both counties. The counties of eastern England were also part of the Danelaw. But the Scandinavian influence was less. The steep pitched, angular roofs of the Eastern tradition, seem to have an even older pedigree. The distinct straw ridges and turned gables found here, show links with the craft in Germany and the Netherlands. In the early middle ages, this was home to the Angles, Saxons and Frisians; who, in eastern England quickly overcame and seemingly displaced the native Britons. This seems to be the only large area of Britain, where the English settlers were numerous enough, to either thatch themselves or enforce their styles on any remaining native thatchers. Later Vikings hereabouts, seemed to have had little influence on the craft; probably occupying only the upper echelons of society; the English doing the thatching in their own style. Foreign influences 1… On the left, Danish thatch, at Roskilde. Showing boarded gables and some angular thatch. With only the ridging differing from the Northern tradition. Here, ‘to thatch’ is to ’Taekke’. Similar indeed, to the ‘Thack’ and ‘Theak‘, terms, formerly used in the Northern area. 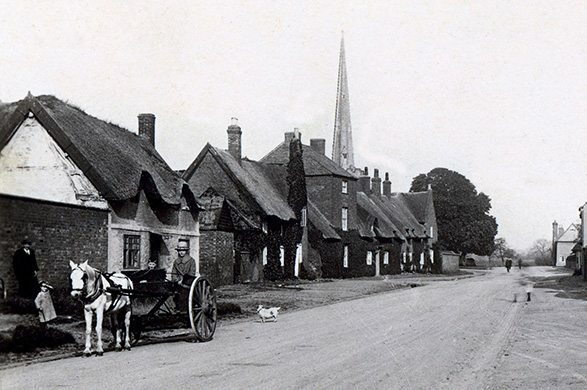 The right image shows some Leicestershire boarded gables… At Queniborough, in around 1915. The near and centre thatches, are turf ridged. The far block of cottages are topped with mortar. Foreign influences 2… Typically Essex… the lower left image shows a splendid example, of ornate long straw thatching, at Broxted. With a similar ridge end to that on the buildings, from north Germany, a century ago. An outline common in the Eastern area; as are the gables and general roof shape. The people of Wales have kept their distinct culture more than most and a common style of thatching should be found here; which in theory, would show what tradition was used, when a Welsh/British culture covered most of Britain. There was one, but it is now difficult to see it as over time this original tradition has being overlaid, with later, imported working methods. And has always had to adapt to material shortages. 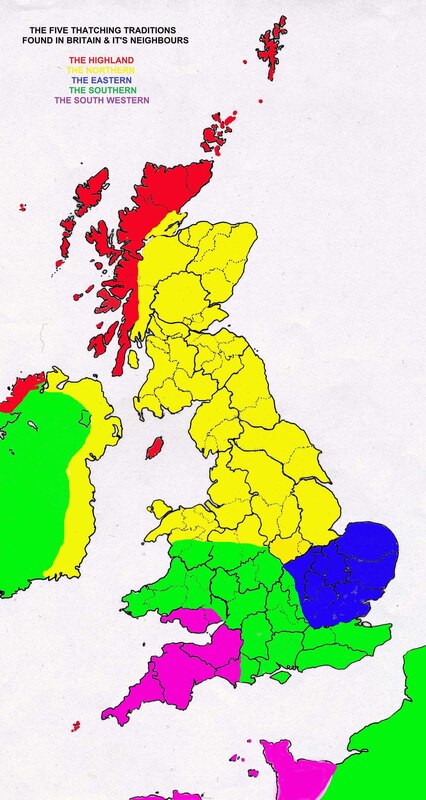 With North Wales, the classification appears straight forward; thatchers following the Northern style. Turf ridges and boarded gables abound. There was little Viking influence here but as is noted, in the History page on the later middle ages; the spread of the Northern tradition, in North Wales, could be associated with some forced labour. From neighbouring English counties, used to build the castles and thatch the new towns, for King Edward, in the late thirteenth century. In the more southern counties of Wales, turf is found as a basecoat, and the stobbing method was common. But straw ridges are normal, as are turned gable ends. And the roof shapes are generally curved; all aspects of the Southern tradition, with allowance being made for a scarcity of thatching materials. There was little outside influence here, until relatively modern times; so these appear to be the original thatching methods. Thus it is possible that most of Wales was once part of this Southern tradition. As were the areas, now covered with the Northern and Eastern thatching styles; in the rest of Britain. This border, between the historic use of long straw and combed thatch, was like Watling Street, once the boundary between peoples but this one was older and more difficult to cross. In the sixth century, what the native Britons called Coit Mawr or The Great Wood; lay across most of this boundary; impeding contact, both peaceful and warlike. Today fragments remain, as the Selwood Forest. To the north, lay a fifty mile defensive barrier, Wansdyke. Only the dyke of King Offa was built on a grander scale. In Dorset, other earthworks were constructed and the dense New Forest was rarely crossed; all helping to keep the advancing English at bay. So for a long while, the people to the west of the great wood, looked south and north, not east, for culture and trade. There was nothing new in this, as strong links between South Wales, the south western peninsular of Britain and what is now Normandy, Brittany and the Channel Islands, go back thousands of years. Thus it should come as no surprise to learn that these areas also have a history of using combed thatch. Who gave whom, the idea of using this material is lost in time. When the English finally broke through the great wood, it was the local tradition of thatching that continued. As in the Southern area, the new masters were either too few, or too far up the social scale, to influence the style of thatching. Divided Dorset… Both the above thatches have a similar shape and lie less than a dozen miles apart, either side of the county town. The upper, 1920’s thatch at Plush; is in long straw, with the lower, at Littlebredy showing a very neat roof, in 1860’s combed wheat reed and some almost ghostly inhabitants. The Georgian agricultural reporter placed the dividing line between these materials, further east; but the later mechanised thrashing boom, created a resultant expansion, of the long straw area. A position now reversed, with long straw thatching basically lost in this county. The reporter also gave a reason for this divide, which is discussed below. Why the Britons of the South West, preferred combed thatch and those in the other areas did not, remains a mystery. This problem intrigued William Stevenson in his 1812 agricultural report on Dorset . He suggested ‘Where on account of the great number of thatched buildings, and the comparative small quantity of arable land, it is important to make the most economical use of the wheat straw‘. This is a plausible theory, but if correct the Highland and Northern traditional areas would surely have also used combed materials. For here suitable straw was often in very short supply. Other Georgian agricultural reporters do hint at some combed material, being used in areas away from the South West. But this all seems purely local and on a small scale.